I love meals where all of the goodies come together to form one pot or dish of goodness. I’m a huge fan and have shared some of my favorites over the years like Guyanese Cook-up Rice, Shrimp and Sausage Jambalaya, Stewed Chicken Pasta, Beefy Baked Penne, One Pot Pesto Pasta and Chicken, Chorizo and Shrimp “Pelau.” It should come as no surprise that I have yet another to share! 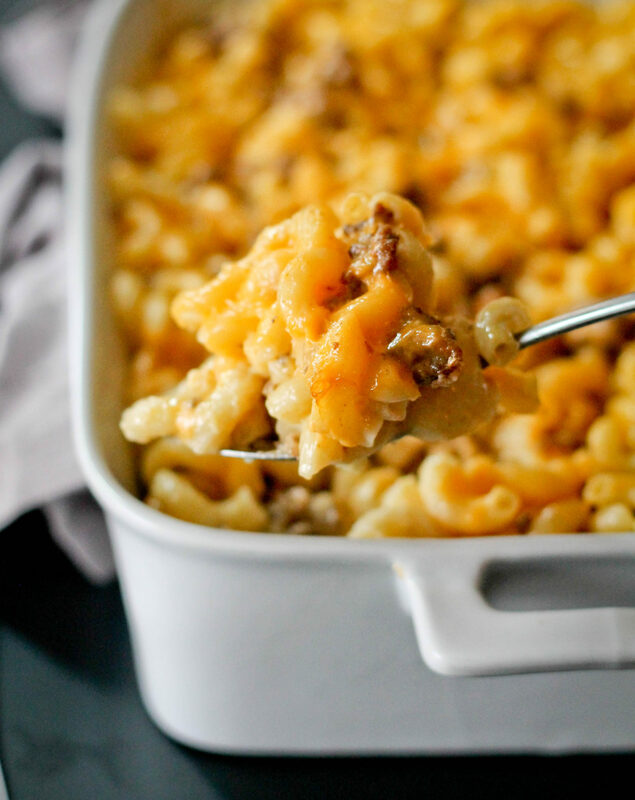 Fact – I love macaroni and cheese, I mean who doesn’t? Add seasoned ground beef and you have upped the ante a bit. Don’t get me wrong, macaroni and cheese is a dish that holds its own but it’s nice this way as well. 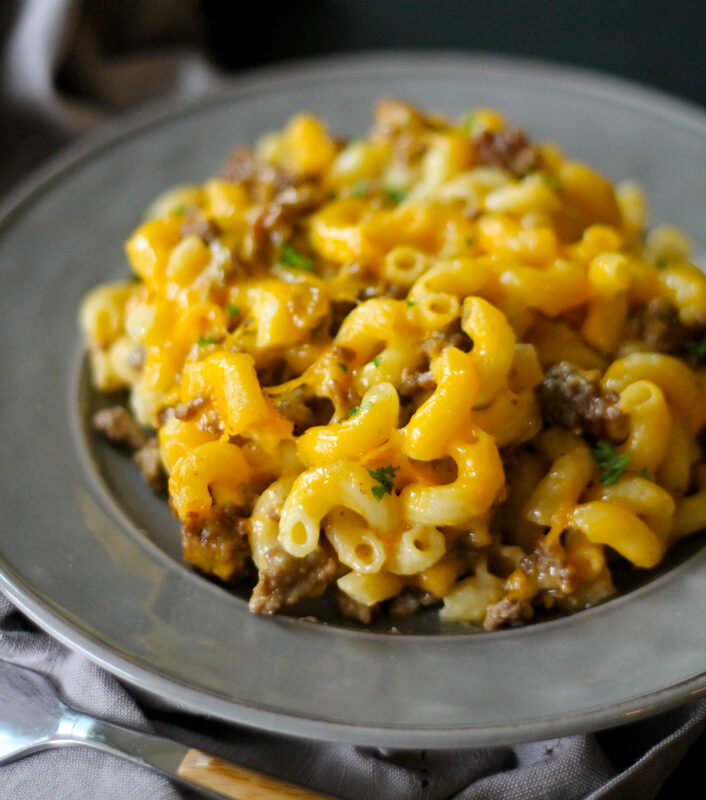 I use my classic macaroni and cheese recipe and added spicy browned ground beef which adds a spicy, meaty flavor to the dish, hence the name beefy mac and cheese. I’ve made this quite a bit and it’s one of the few meals that I don’t have to fight with my 6 year old to eat so it’s a winner in my book. For this dish I kept it simple and stuck to using a good sharp cheddar cheese which gives the dish that cheesy flavor that you’re looking for in a good macaroni and cheese. The meat is cooked with onions, garlic, cayenne and black pepper then added to the macaroni and cheese, I then cover it with a heaping pile of cheese and bake it up until the cheese has melted and bubbling. 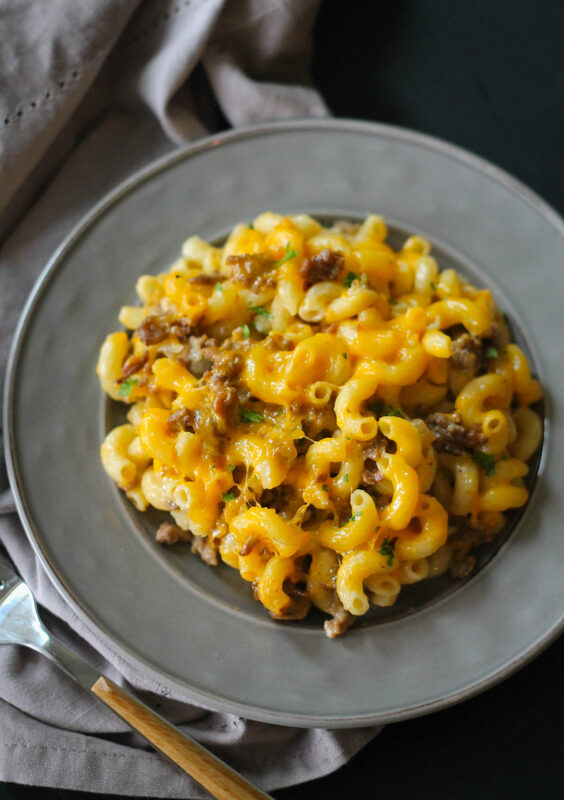 Beefy mac and cheese is great on its own but it you’re trying to have a little green on your plate you can add roasted broccoli, asparagus or whichever vegetable you prefer! Over medium heat, heat oil in a frying pan. When oil is hot add ground beef, salt, black pepper, cayenne pepper and garlic powder and cook until brown then add onion. Cook onion until its softened, about 3-5 minutes then add water and cook for about 10 minutes or until the water has evaporated. Set meat mixture aside. In a large pot over low heat, melt butter. When the butter has melted, add in flour while stirring to make it smooth. Cook for about 2-3 minutes then add milk and stir until smooth. Cook on low heat for about 5 minutes until the sauce begins to thicken then add all but 1 cup of cheese and Dijon mustard to the mixture. Add a pinch of salt to taste. Stir until the cheese has melted and the sauce is smooth then add cooked macaroni pasta and ground beef. Place into a greased 13x9 baking dish, top with remaining cheese and bake in oven preheated to 350 degrees. 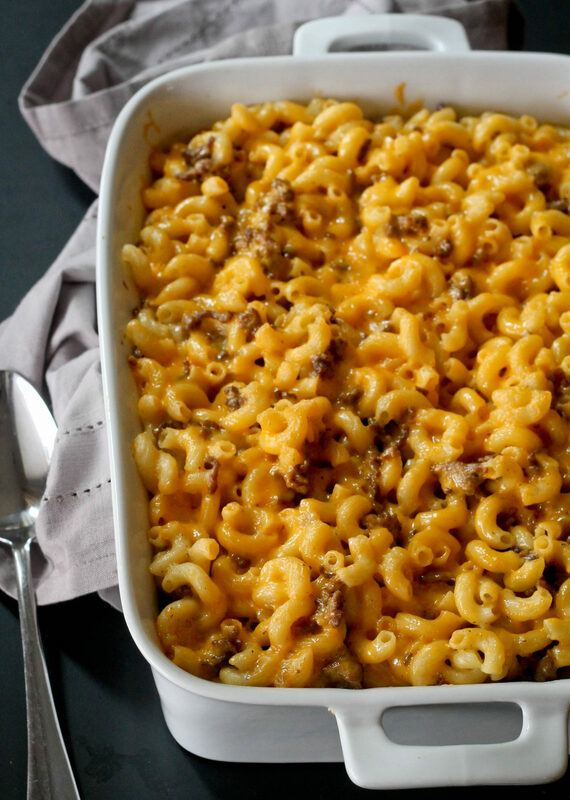 Bake for 25-30 minutes until the macaroni and cheese begins to bubble and the cheese has melted. Remove from oven and allow to cool slightly before serving.